Chili and lemon add the perfect amount of zest to plain ‘ole pistachios. 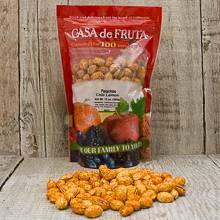 The spicy and tangy flavors make this not only a healthy and crunchy snack, but also a very tasty one. Enjoy these with friends and family! Packaged in a 14 oz. bag. From richard esparza of apache junction, Arizona on 5/4/2017 .